While it can be said that letter writing is an art, the same can be said for writing effective business emails that actually get your message across without miscommunication. To help, we have set ourselves the task of breaking down the structure and wording of an email, so even those who like sending emojis as their preferred communication tools will get the job done right the first time. Failure to add a title in the subject line will mean that your email may be overlooked or even deleted. Use a helpful description which sums up the contents effectively. Avoid using the term important unless it really is. Never use an old email, that is not relevant to the topic at hand, to start a new email discussion. Always compose a new email with a new subject line. 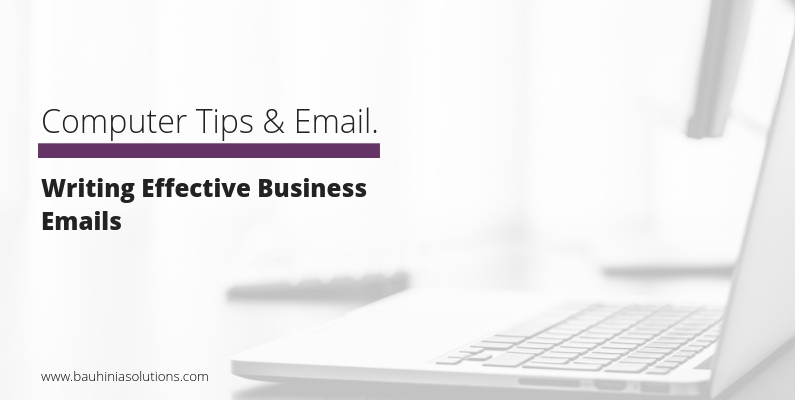 Your email should be informative and direct, providing all the necessary facts without going overboard. Too long, and it will be shelved and possibly even forgotten. If it involves a lot of information, perhaps a phone call would be better. Avoid the use of fancy or overcomplicated fonts which serve no purpose to the message. Like a letter, use paragraphs to break up your thoughts and ideas. It can be confronting when you open an email and are presented with wall to wall text. Don’t be afraid to make use of bullet points, numbering and text bolding to make things stand out. Failing to provide all the necessary information the first time will create a chain of emails a mile long. If it is your first contact with this individual, then make sure you introduce who you are why you have contacted them. Avoid short text-like emails as it is easy to become confused with all the unnecessary toing and froing. If you get it right the first time, then only one reply will be necessary. Just like a letter, begin with a salutation and the person’s name. Even a simple hi or hello will suffice. Then finish up with a fitting sign-off. Something along the lines of regards, kind regards, all the best, thank you, or best wishes will do the trick nicely. Cc (carbon copy) and Bcc (blind carbon copy) are two very helpful tools. If the information you are sending is relevant or helpful to another person, then you can copy them in on the email using Cc. Bcc is used when it isn’t necessary for each party to know or even see the entire list of recipients. While emails are less formal than letters, they still need to be professional and polite in manner. Avoid informal language, slang, and emoticons unless you are on an extremely familiar basis with them. Consider how you would feel if the email was shared around the office. Manners work best in all cases. As a rule, it is good to start with Dear, and as you become familiar with a person, you can start with Hi or Hello. It is so easy to misinterpret the language of emails, so it pays to be cautious when it comes to capitalization, punctuation such as exclamation marks, and even the length of the sentence. Avoid being over friendly unless you are already familiar with the person. Email viruses are a common issue so avoid sending an attachment unless you absolutely have to or if it was requested. Sending an attachment to an unknown recipient and forcing them to open it to read what you have to say will quickly see it thrown in the proverbial wastepaper basket. Copy any necessary contents in the body and then ask if they would be interested in seeing the original document. Again, manners! If you need to send an attachment, it is better to send a PDF document, rather than a Word or Excel document. Have you ever hit send and then noticed an error just as it was winding its way to the recipient? It’s a common story, unfortunately, so always read your email thoroughly to check for grammar, spelling, and punctuation errors. If in doubt, copy it into Word for a spell check or use a third party site like Grammarly for a more comprehensive going-over. When in doubt, save it as a draft and then come back later and reread before sending. Interested in reading our tips on Email Etiquette? Read our first 10 tips on email etiquette, and our additional 10 tips.